"Everyone who values democratic education needs to see this." "A heartbreaking account of massive educational theft." "This film tells a cautionary tale that is real. It's present." 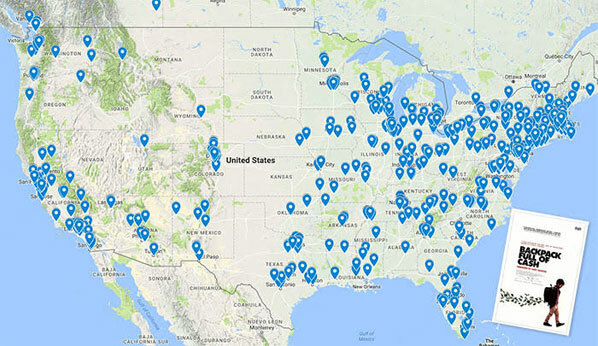 Join the more than 3,000 groups and individuals from around the U.S.—and the globe—who have contacted us about screenings! Click below to find out how you can bring the film to your community. In many places, public education is at a tipping point. Leaders in Washington are calling for a massive increase in funds to expand privately-run charter schools and vouchers. Now is the time to join the movement to stop privatization and strengthen public schools. Consider hosting a screening in your community. Film can be a formidable tool for bringing people together, sparking discussion and driving change. Connect with groups working to support and strengthen public schools that serve all students equitably. Learn more about the issues involved. BACKPACK can spark discussions and pave the way for meaningful change. Help fuel our nationwide community engagement campaign! Here are some of the individuals who were interviewed for BACKPACK FULL OF CASH, and whose impressive work we drew upon in making our documentary film. Matt Damon is an Academy-Award winning actor, film producer and screenwriter. He is also an advocate for public schools. Matt’s mother, Dr. Nancy Carlsson-Paige, is an expert on early childhood development and author whose books include Taking Back Childhood: A Proven Roadmap for Raising Confident, Creative, and Compassionate Kids. Check to see if there is a screening near you. If not, click here to find out how you can host a screening and bring BACKPACK to your community. People working together are the best force for change. Sign up here for useful updates, helpful suggestions, and great resources for strengthening public education in your community. COPYRIGHT ® 2019 STONE LANTERN FILMS, INC.